How to get back into fitness after pregnancy. There’s a good chance that by about 2 months you already got to know your little one’s habits and sleeping patterns, so be smart with your time. For example: I know that my mornings are busy feeding, changing nappies, making myself something to eat etc. so after all that is done I know I will have a little bit of time when she will sleep after a good feed, so I pop her in the rocker with some music on quickly grab my dumbbells and get right into it. 20 min work out is all you need most of the times and you can easily do some simple exercises at home while your bub is near-by. Make sure you keep your core nice and tight throughout the workout, if you have abdominal separation then you need to take care of your core and strengthening it is super important because, how strong your core is will determine how much back pain you will end up getting. Needless to say the days don’t always go as planned, sometimes the bub will sleep as they are expected to and other times they will wake up 100 times. Remember that even if you end up doing 10 mins here and 10 mins there and even if your workouts are interrupted you still done something. The other day I had to split my workout into 2 parts, because my little rascal got woken up by our dog barking (aggghhh), so I managed to finish 1.5 circuits and only half an hour later the other 1.5 circuits which consisted of about 5 exercises. The main thing is I still did my workout and I feel proud of myself for doing so regardless of the circumstances. While it is not recommended to do intense core work in the first few months postpartum simply because your abdominal wall has been through a lot, especially if like me you had a diastasis recti (abdominal separation). However, you should not neglect it either, you do need to get it stronger. I started with being aware of what my core is doing through the daily tasks. For example when I pick up the bub from the cot or pram I contract my abs and keep my back straight. When I get up of the couch or bed holding my bub, I contract the core and keep my back straight. When I walk, again I keep good posture by keeping my abdominal muscles slightly contracted rather than letting it all hang out. It’s tricky to remember to do it all the time, but if you keep reminding yourself to do it as much as you can for the first 2-3 weeks it will become a second nature and you will start doing it subconsciously. So if you are going for 40 min walk, that’s 40 mins that your core can be doing work without you taking any extra time, just by simply keeping good posture and slightly tightening your core muscles while you are walking. Sure you will forget from time to time, just try to catch yourself when you do and tighten it back up. Don’t just go grocery shopping without a list, make a list of food items that you know will be easy to prepare or easy healthy snacks that you can just grab and go. Because being a mum sometimes cooking for yourself is just not an option so you will find yourself snacking a lot. Make those snacks healthy. Have lots of them and a variety in your fridge and cupboard. Or ingredients that will allow you to throw something together very quickly. Like roasted chicken, turkey breast, cherry tomatoes, low fat cheese pieces, tinned salmon etc. For a healthy quick meals for busy mums jump into our Facebook group, I have popped it into the files tab, if you can’t find it just message me and I will tag you in the post. Making meals for yourself and your other family members to please everyone can be tricky. So here is what I do. I cook up some protein, sometimes even all in one pot with veggies or roast a chicken or beef with veggies. Then then I cook up a whole big container of brown rice, quinoa or sweet potatoes, serve a whole bunch of it for my husband and for myself I only serve a very small amount of the carbs, if I am really hungry otherwise, just eat the protein and veggies. Cook enough healthy carbs so you can throw it into a salad for lunch the next day or two. I just throw in a bunch of mixed leaves, half cup of my precooked carbs, avocado, some cherry tomatoes and whatever left over protein I have or even a tin of salmon or tuna, mix it in a bowl top with some dressing and here is my lunch, only takes a few minutes, but I know that not only I have healthy dinners but also healthy lunches. 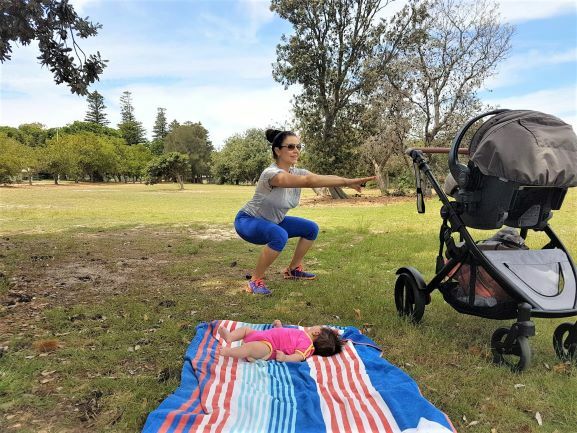 As I mentioned before first of all, try to keep your core tight while on your walks, secondly try to take on those inclines and heels when possible, there is nothing like pushing a pram up a heel to get your heart rate up and burn extra calories as well as getting your fitness up. Don’t be lazy, just do it! Most importantly, get back into doing something as soon as you get clearance from your doctor and get your core and pelvic floor checked. Because the longer your put it off the harder it will be to get back into it. I see far too often mums come to me asking to help them get back in shape a year later after they had their baby, frustrated and annoyed with themselves that they let it get away from them so far, stacked on all these extra kilos and now have to fight hard to get back on the fitness wagon. The sooner you get back into it the easier it is, simple as that! If you ever have any questions or need some help with getting back into fitness lifestyle just give me a yell, I am more than happy to help where I can. I am a mum just like you and know how tough it can be.